After giving the now-retired Sir Anthony McCoy his one and only success in this race 12 months ago, the John Kiely-trained 10-year-old was an unfancied scorer 20-1 this time round in the hands of Mark Walsh. Carlingford Lough was at the rear for most of the Grade One over an extended three miles but was coming into contention approaching the final fence, which the Willie Mullins-trained Valseur Lido hit hard. 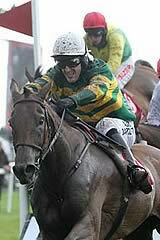 He was on his nose and gave Ruby Walsh no chance of staying in the saddle. Noel Meade's Road To Riches (5-4 favourite) was left briefly in front, but he had no answer to Carlingford Lough, who went on to score by 12 lengths with Fine Rightly (33-1) running a huge race in third. RaceBets gave the winner a 16-1 from 50-1 quote for the Cheltenham Gold Cup and went 25-1 from 66-1 for the Grand National. Boylesports cut Kiely's star to 16-1 from 33-1 for the Timico-sponsored blue riband on March 18. Coral went 20-1 from 66-1 and Ladbrokes 25-1 from 50-1. Walsh came in for the ride as owner JP McManus' retained jockey Barry Geraghty plumped for Gilgamboa, who finished fifth. The winning rider said: "I didn't think I was going to win three out. "They went a hell of a gallop the whole way and I was never travelling, never happy with him at all. "I just kept going gently with him, but at the third-last I thought I was going nowhere and I was nearly going to pull up. "I just kept tipping away and once I jumped the second-last the others stopped in front of me and he kept galloping. "He stuck his head down and sprinted, winged the last and just galloped home to the line. "I was the one that was quickening when Ruby hadn't gone for Valseur Lido, but I'm pretty confident I would have won anyway. "It was a brilliant feeling. To be going round there thinking you had no chance and considering pulling up at one stage and then to win by 12 lengths - it was just brilliant. He's a good horse to do that." McCoy said: "It was a good performance. He came home well and he might have won anyway. I know Ruby's mount got rid of him at the last, but the way he come home from the last he'd have been hard to beat." Kiely admitted being surprised at the outcome. "I didn't think he could win two Irish Gold Cups," he said. "He was in good form, but I was just hoping to be in the first four. I told Mark to ride him to finish, and it worked. "I think he won despite the ground, and if he was up with the pace I don't think he would have got home. "Going to the last you could see he was finding a new lease of life, and I thought he had a chance then. It's lovely for Mark as he's done a lot of the ground work. "We'll see how he comes out of the race before deciding what to do, and we'll see what JP and Frank (Berry, racing manager) want to do." Mullins, meanwhile, felt Valseur Lido ran a fine trial for Cheltenham, despite his blip. He said: "He didn't look like he was stopping, so he's booked his ticket for the Gold Cup I thought there. Connections (Gigginstown House Stud) would have a lot of runners in the Gold Cup and Ryanair, but to me he wants every bit of the trip. "That was three miles on heavy ground and he was running a very good race and I thought it was a good trial for whatever he runs in." Meade said of the beaten market leader: "I'll have to watch it again, but I was never happy watching it and I don't think Bryan was happy riding him, we'll wait and see but from how the race finished up I'd have thought maybe the front runners went too hard. "He got dragged into that a bit, and he walked from the last home, as did most of them. The winner was last turning in. "I think at this minute in time that they got the pace of the race wrong and went too quick in front."